At a time when the world seems at odds with itself, social enterprise JMBUSHA is challenging Africa to lead the way in peace and unity with a race that will not fill the streets, it will fill the record books. At its heart, the JM BUSHA 54 Races for Peace and Unity has an extraordinary vision: 54 countries, 54 races, all on Africa Day, all for peace and unity. In this, the inaugural year, the first of these races will take place in Zimbabwe on 25 May 2017 and in Johannesburg on 28 May 2017 and a third will take place in Kenya, later in the year. 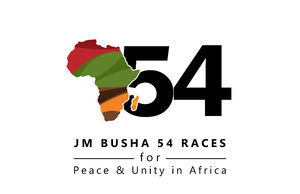 JM BUSHA 54 Races for Peace and Unity is a citizen driven initiative, with aim of encouraging individuals to take responsibility for peace and such grow the movement. The objective of 54 Races is threefold; to educate and promote peace through sport; to engage and enroll individuals and institutions to actively promote and pledge peace, unity accountability and responsibility at all levels of society, organisations, and governments; and to raise money for the AU for peace keeping missions, mediation efforts and crisis management in Africa. From a logistics perspective JMBUSHA aim to form partnerships with the different stakeholders in each country, including local government, sports clubs, churches and civil society organisations. Race Ambassadors – key individuals that exemplify the message of the 54 Races – and student ambassadors will play a strong role in the development and promotion of the race in their respective countries. Through the student ambassadors programme JMBUSHA aims to incentivise student ambassadors to develop solutions to problems in their own countries with prize money available for the winning solution. “Our vision is to build peace in Africa and the entire world thereafter. How do we try to create the good society that we all seek? How do we as a people live together in our diversity and make sure we do not escalate the misunderstanding and equality that exists across the globe?” asks Mr. Joseph Makamba Busha, CEO of JMBUSHA and brainchild behind the JM BUSHA 54 Races for Peace and Unity movement.